I believe it was July of 2011 when I came home from work one afternoon to discover my 10-year-old stepson, Dawson, had convinced his grandparents to let him pen a heifer to show in the county fair. She was a pretty little 1-year-old heifer, peach colored with a white face. Since she was the color of peaches and cream, we called her Peaches. Dawson was super excited about her and could not be deterred from wanting to show her. We all explained that it was much too late in the year for training a show cow. With the county fair just two months away, there was simply no way she could possibly be ready to show by September. If he wanted to show her we should have started working with her way back in January or February. Dawson’s enthusiasm remained steadfast. He was convinced he could have her ready and was determined to show her at the fair. So, I determined to help him all I could. Every day, he and I spent time with Peaches, getting her used to us. We got her to eat out of our hands and let us pet her. We taught her to stand tied without too much fuss. We made a lot of progress with her, but we never did get her to halter lead. I spent many hours in the pen with Peaches on a calf halter, trying to lead her. The more I pulled the more she resisted. She just locked up and refused to budge. I tried pulling to the side so she had less balance to resist. She would take one step to the side and go right back into lock-up resistance mode. We talked to friends who raised show cows asking for advice. The prevailing advice was to teach her that resistance was futile. She had to learn that following was her only option. They advised hooking her to a tractor and pulling her very slowly to teach her to stop resisting and follow the lead. So, we did that. I spent many hours slowly driving the tractor around in circles pulling peaches one resistant step after another. She actually got to where she would half-way follow the tractor, but only with substantial tension in the rope. With me trying to lead on the ground, she was more resistant than ever. With final fair entry dates rapidly approaching, Peaches was no closer to being halter trained than the day we started. We did the only thing we could do…we turned Peaches back out in the pasture with the other cows. I honestly think I took it harder than Dawson did. Even though I knew it had been an impossible task from the start, I had gone all-in trying to help him train her, and had failed. 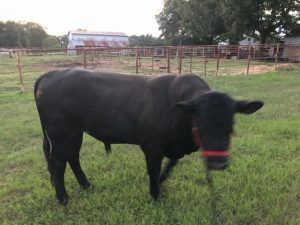 Sherri’s parents had penned a nice looking 2-year-old bull to keep the older (much larger) bulls from injuring him before he got big enough to protect himself. With Dad recuperating from surgery I started feeding the bull twice daily. The bull was super skittish. When I entered the pen, he fled to the other end. When I poured his feed, he watched until I left the pen before approaching to eat. When I tried approaching to pet him while he ate, he fled before I came within two feet. In July, the bull became covered up with flies, constantly swishing his tail and tossing his head trying to halt their torment. The poor guy looked absolutely miserable and became even more unapproachable. I started planning a means of helping him get some relief from the flies. The best approach would be to fly-spray him, but that would require getting him to stand still long enough to be sprayed. The last couple of years I’ve been learning a little about horsemanship and I decided to try desensitizing the bull to a spray bottle just as I would a horse. I filled a spray bottle with water, walked up as close as he would allow, turned my back to him and started squirting water away from him. He was disturbed and started moving away, so I moved with him, still facing away and still squirting water. When he stopped, I stopped squirting. After a few minutes, he would stand still while I squirted water away from him. Then I started squirting in an arc that got water closer to him, while still facing away from him, and we repeated the same thing until he accepted that. Then I turned to face him and did the same thing all over again. At the end of about twenty minutes, he would stand still for spraying. So I switched bottles and fly-sprayed. With relief from the flies, he became a much calmer bull. A few days later he let me pet him while he ate. A couple of weeks later he started coming to me for treats. By the end of the month, he was positively friendly. I started calling him Ferdinand (after the gentle bull in the children’s story) and bought a halter for him. Using the same pressure and release technique I would use on a horse, I had him following a lead line pretty quickly. By rewarding the smallest try with instant release, Ferdinand quickly learned what I wanted and followed willingly. I wouldn’t call him completely halter broke yet, but he leads really well and backs okay when not too distracted. He and I are having a lot of fun, together! I keep thinking about these two experiences with cattle training and their completely different outcomes. With Peaches, I set out specifically to halter train her, spent many hours working with her, and completely failed. With Ferdinand, I just tried to gain his trust to help alleviate his fly misery…and almost effortlessly halter trained him in just a few minutes a day. Two drastically different outcomes…based on different approaches. With Peaches, I set out to make her learn. We had a very tight time table and needed to progress rapidly. I viewed her as being stubborn and acted accordingly trying to show her resistance was futile. It was a fast-paced conquer-by-force approach that did not work well at all. With Ferdinand, I set out to gain his trust in order to help him. I used timing of pressure and release to teach him a little at a time, only giving him as much as he was prepared to accept…and it worked incredibly well. Isn’t it the same way with people? We set out to make somebody do something or to prove somebody wrong and our headstrong approach is met with nothing but resistance. If we, instead, set out to gain someone’s trust in order to help them see things a little differently, we may see drastically improved results. I’m sure glad God uses a gentle approach with us! P.S. Oh…about Peaches… Peaches is still part of the herd and is a good mama-cow. All that time spent with her was not wasted. She is the calmest, gentlest cow in the herd. 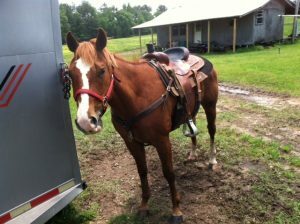 Lately, I’ve been using her to help train my horse, Knockout, to move cattle. She is super easy to guide from one end of the pasture to the other. She makes Knockout and me look really good, providing good practice and confidence building. I paused, pondering the question and possible responses. Honestly, the question would have been easier to answer a couple of years ago when I knew less about the topic…which meant I was probably overthinking the question. Should I start with explaining I don’t make a horse do anything, I ask him? No, she’d think I was just being nit-picky. Should I talk about differentiating cues for different speeds? No, she almost certainly meant moving from a standstill to walking and continuing to walk. Should I start with explaining it depends on the horse’s level of training? No, she was clearly referring to a well-trained horse. It was asked as a simple direct question with expectation of a simple direct answer. It was a simple direct question expecting a simple direct response. My response was as simple and direct as I knew how to make it. Yet I knew it likely had more qualifiers than she expected. I also knew was a very incomplete answer…and not very useful. I knew the situation she was referring to. I’ve experienced it myself a few times. A novice rider on a rented or borrowed horse starts out with a group of riders on a trail ride. The borrowed horse falls behind the group and slows to a gradual halt. The novice rider clicks, kicks, swats, or in some other way tries to prod the horse to move out. The horse responds by picking up to a trot for a few strides then drops right back to a slow walk before stopping to browse on grass or leaves. The answer I gave was a truthful answer, but of absolutely no use to a rider in such a situation. 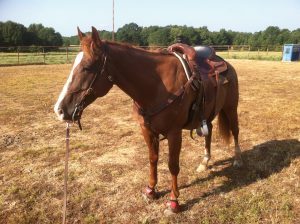 A horse that did not respond to clicks, kicks or swats was unlikely to respond to a shift of weight or a lift of reins. To inspire a horse to go in such a situation, one must first understand why the horse stopped. Most likely, the horse stopped walking because the rider stopped riding…or maybe never started riding. However, that answer requires explanation of what riding entails. Riding a horse is more than being a passenger. Riding is active. Riding is movement. Riding is communication. I don’t just ask my horse to go. I also ask him to continue going. I move in rhythm with his movement, then ask him to move with my movement. If I stop moving, I expect him to also stop moving. “How do you make a horse go?” Such a simple direct question…deserving of a simple direct answer. Yet master horsemen have written volumes trying to answer that question, and will tell you they fall short in the telling. Why is the answer so complicated? Because the answer involves relationship and communication…because a useful answer must first bring the questioner into a paradigm of beginning to understand a little of that relationship…and because every horse and every rider are different. Pondering these things I am reminded of the many questions we ask about godliness, expecting simple direct answers. Why would we assume simple direct answers could possibly be either complete or useful? Human relationships are exponentially more complex than horse relationships. Human communication is much more nuanced and prone to misunderstanding than horse-human communication. The Bible tells us God’s ways are much higher than our ways and are beyond our understanding. Yet, we stubbornly persist in asking simple direct questions from incomplete paradigms in expectation of simple direct answers. 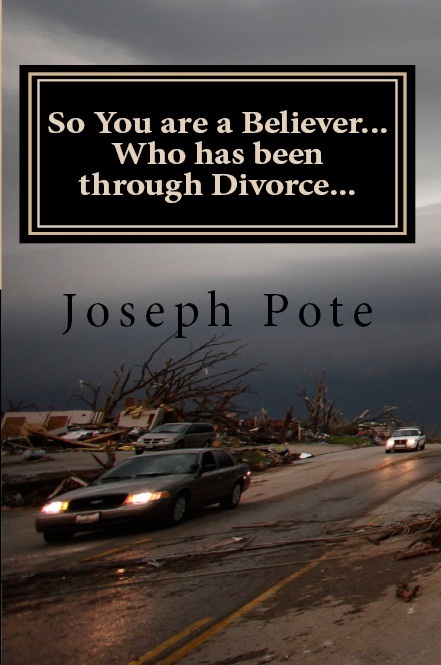 Ask ten different theologians, “When is divorce permissible?” and you will likely receive ten different answers. But that’s not the puzzling part. The puzzling part is that nine of those ten theologians will likely respond with a simple direct answer…confident they have provided an answer that is both complete and useful…the sum total of what God has to say on the topic. Human relations are extremely complex. Marital relations are even more complex than most. Marital relations in a marriage having gone so badly wrong for one or both to be asking about divorce are likely full of complex contradictory emotions and many years of trying and failing to effectively communicate or effect change. A person asking the question, “When is divorce permissible?” is clearly interested in pleasing God. Otherwise, there would be no need to even ask the question. Discerning God’s plans and intentions for any person’s life in any given situation is difficult, requiring listening to the Holy Spirit and understanding His cues. Yet, many pastors and theologians seem to believe they can speak godly wisdom into people’s lives through trite prescribed wooden answers assumed to fit every situation. And a person asking such a question is likely in very real need of wise godly input. They don’t need a trite rhetorical response. They need help and understanding. They need useful input and prayerful suggestions. An answer that is incomplete and unhelpful is worse than no response at all. A simple “I don’t know” would be much better than a misleading answer to such a question. Anyone who believes such a question can be usefully answered with a trite canned response is lacking in wisdom and discernment. Saturday morning dawned clear and cool with a light breeze…a welcome respite from our usual hot, humid, sultry August weather in south Arkansas. I woke early, had a cup of coffee, and headed out to saddle a horse. I had at least a couple of hours before the rest of the family awoke and intended to fully enjoy the morning. I wanted to ride the woods trails this morning. I’ve avoided the woods the past couple of months, opting instead for arena or gravel roads. The woods oppressively confine the suffocating heat and stifling humidity, creating an environment rich in biting insects. This morning’s low temperatures and light breezes carried hope of an enjoyable woods trail ride. I brought Knockout (our six year old AQHA gelding) up for grooming. I was pleased to see the scrape on his side has healed. It was just a minor scrape such as horses acquire while running the pasture with other horses. However, knowing the rub of a saddle pad can interfere with healing of wounds I had refrained from riding him the past week. Saddling up, it crossed my mind to wonder if we’d have any issues on this ride. Young horse…cool morning…hasn’t been ridden in over a week…taking him to an area he hasn’t been in a few months…thru trails likely overgrown during the summer…a recipe for disaster? Just as quickly, I put the concerns aside. Knockout was calm and my confidence in him has grown as I’ve worked with him the last few months. I mounted, petted him a couple of times, then barely lifted the reins. Knockout eased forward and I just moved with him as he slow-walked down one side of the arena. As I turned and looked down pasture, Knockout moved with me, walking easy in the direction I faced. Knockout started drifting right a bit, headed toward a different route than I had in mind, “Hey, Joe, let’s go this way.” I moved my left stirrup away, “I’d rather go left, Knockout,” and he came back to center. This time I agreed with his concern and looked right downstream, “You’re right, Knockout. That looks a little dangerous. Why don’t you find a safer crossing for us?” A few yards downstream we crossed at a wider place with no steep sides or deep trenches. Coming out of the creek crossing, I looked toward a large oak tree at the back fence line and lightly squeezed my legs. Knockout responded with a long trot on a straight line. Trotting thru the middle of the cattle herd, we both watched the cattle in our peripheral vision, without breaking stride or turning our heads. We both stayed focused on each other and our ride. Not far from the back fence line we turned thru an opening in the tree line to cross into the next pasture. What a surprise awaited there! A huge flock of Canadian geese were scattered across the pasture. As we trotted straight toward the middle of the flock, about a hundred geese took flight simultaneously. It was quite a sight! Yet we never broke stride or turned our heads. We continued trotting straight toward the next tree I had picked as a direction marker. Nearing the start of the woods trail, I slowed my movement and Knockout responded by dropping into a walk as we entered the woods. As expected, the trails had overgrown a bit, but we smoothly navigated between tall brush and overhanging branches with the lift of a stirrup here and a brush of a calf there. Smooth…light…soft…easy…graceful. It was truly an amazing ride! On the one hand, no one thing was particularly spectacular. No one thing stood out as something we hadn’t practiced before. Yet, it was amazing to experience it all coming together in a continuous flow through the entire ride. I hardly ever moved my reins. I barely even moved my legs. Yet we communicated beautifully. Up until a few years ago, I had no idea it was even possible to steer a horse with anything other than the reins. I thought light horsemanship was neck reining instead of plow reining. Even when I began to learn a little about the possibility of softer cues, I wasn’t very interested…it all sounded rather mystical. I certainly never thought I could ride with such lightness! And the idea of training a horse myself would never have even crossed my mind as a possibility. Yet, here I am riding this amazing creature with incredible lightness! Yes, I realize the next ride will likely not be quite as smooth. But I also realize there will be more rides that are as smooth. So…why am I writing this post about a wonderful ride with my horse? Many of my friends and family who aren’t into horses won’t really understand why I would go on and on about how well my horse handles. Many friends who are accomplished horsemen may think it’s pretty humorous I’m just now learning things they’ve known their whole life. A few friends who are pursuing horsemanship may appreciate and relate to my experience. February of 2016, I was at the low point in my cancer treatment. I had been diagnosed with cancer the previous December and undergone two surgeries. Then spanning January to March, I went thru seven weeks of radiation treatment twice a day and chemo treatment once a week. The surgery took a major nerve to my right shoulder, leaving me with limited movement of my right arm. The end of January, during the middle of a chemo treatment, our horse trainer called to tell us the 4-yo colt we’d left with him for 60 days was not going to work out. He said the horse was “training resistant” and recommended selling him and buying a better prospect. Sherri and I left from the chemo treatment and drove 3 hours to the trainer (without returning home in between) to pick up our colt. We got him home to discover he had been mishandled, was injured, and had become very frightened of men. Now, think about that for a second. I was no horseman by any measure. I was a poor rider with little experience and no skill. I knew nothing about training horses. I had never roped. I had very limited motion in my right arm due to a surgically removed major nerve. I was undergoing chemo and radiation. I was very weak. Most days it was all I could do to keep enough calories and fluids down to make it thru the day. And here I was saying that not only was I going to learn to rope and learn to train horses, but I was going to start with a horse who had been rejected by a professional trainer, who was afraid of men, and I was not only going to train him to ride, but I was also going to train him to be a roping horse. That’s pretty audacious! Why on earth would I say such a thing, much less work to follow thru on it? Has God ever asked you to do something that just didn’t make any sense? Do you remember the story of Naaman who came to the prophet Elisha asking to be healed of leprosy? Elisha told him to go wash in the Jordan River seven times and he would be cured of the leprosy. It made no sense! Why should he wash in the Jordan River? Wasn’t the water he washed with good enough? He wasn’t even dirty. Why should he wash? Yet, despite the instructions making no sense, Naaman followed God’s direction and washed in the Jordan River seven times…and was healed. That’s what this was like for me. I was supposed to learn to rope? I was supposed to learn to train horses? I was supposed to train a young green-broke, tense, energetic, spooky, flighty young horse to be a roping horse? It made no sense! I can’t even explain how I knew I was supposed to do this. No prophet told me to. God did not speak to me in an audible voice. Yet, somehow, the Holy Spirit made it clear to me this is what I was supposed to do. Here I am a year and half later. I have decent mobility in my arm…which my physical therapist attributes directly to my determination and perseverance in working with that young colt…and to practicing roping. I’m still not great at roping…but I’m steadily improving. I’m far from mastering horsemanship…but this young horse I’m working with has sure come along well. We’re not roping calves or steers yet…but I regularly swing a rope from his back and push calves around the pen. We’re still working on the fundamentals…but we’re getting pretty close to seeing all the pieces come together to try roping. Eighteen months ago this looked like an impossible task…right now it’s looking pretty achievable. God sometimes asks us to do things that sound crazy…because all things are possible with God. Along the way, I’ve found a lot of healing. The horsemanship and roping have aided both physical and emotional healing…for both Knockout and myself. And I have learned a lot! I have learned to do things that I didn’t even know were possible to do. I’ve learned a lot about myself. I’ve learned a lot about relationships and communication. I’ve even gained a better understanding of God and of His position toward us. The master horsemen, Ray Hunt, Bill and Tom Dorrance, Buck Brannaman, all wrote about horsemanship as a lifestyle that affected every aspect of their lives. They believed it not only improved their relationship with the horse, but also their relationships with people. I still don’t know the full reason God asked me to do this. But I’ve already seen a huge return on the investment…and believe there is even more to come. God still asks His people to do crazy things…and He still does the impossible. I’m still not much of a horseman. However, in working with our two young horses (a 1-year-old and a 5-year-old) I’ve been doing a lot of reading and watching videos on the topic of horse training. Although I’ve barely scratched the surface, I am really having a lot of fun learning! I’ve noticed a common training theme that is frequently repeated in every chapter and/or video. Some call it the principle of pressure-release. Others call it making the right thing easy and the wrong thing hard. I just finished reading Ray Hunt’s book, Think Harmony with Horses, in which he calls it putting the horse in a bind while always leaving an out. It is a very simple training principle with a myriad of practical applications. Carson James has a whole library of videos applying this basic principle to different training situations. In a nutshell, the idea is to set the horse up in a situation where it is easy for him to do what you’re trying to teach (this is the out), but difficult for him to do anything else (this is the bind). Then apply just enough pressure to encourage the horse to find the out (do what you are trying to teach). The instant the horse makes a try (takes a step, shifts weight, turns head, etc.) in the right direction, release the pressure. Take a moment to encourage and reward the horse (pet him and talk to him) then do it again. Repeat until the horse responds smoothly with the desired response. One benefit to this technique is that rather than trying to force the horse to do what the trainer wants, the trainer is letting the horse figure it out for himself. 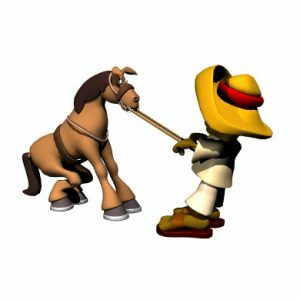 Rather than trying to over-ride the horse’s free will, the horse is learning to voluntarily adjust his will to submit to the trainer’s will. Another benefit, as explained in Think Harmony with Horses, is the bond created between man and horse. Using this technique, the horse learns to consider the trainer as a trusted friend, because the trainer always leaves the horse an out. Over time, the horse gains confidence in the trainer and in his ability to follow the trainer’s prompts. The concept is amazingly simple. The application, however, is an art requiring lots of practice. The first trick is knowing the horse’s personality and training level well enough to know where to start and how much pressure to apply. Difficult tasks often require breaking learning down into smaller steps, so the horse can gain confidence and understand expectations before learning the difficult task. Also, the trainer must apply just enough pressure to encourage the horse to search for the out, but not so much pressure as to panic the horse. As training progresses, the trainer should use less and less pressure, so the horse can learn a quick response to a light touch. The second trick is timing. Pressure must be applied to encourage desired behavior and instantly released at even a tiny try toward desired behavior. The release is what lets the horse know where the out is, and the out needs to be as easy to find as possible. However, as the horse progresses in learning the out, the trainer should hold pressure to insist on a more specific try (such as a full step rather than just a head turn or a weight shift) before releasing pressure. God, who intimately knows my personality and training level, sets me up in stressful situations while always leaving me an out. He knows just how much stress to apply to help me find the out without being unduly panicked. He is my faithful friend throughout…helping me find the right way and helping me learn to follow His prompts. He never forces me, but helps me learn to voluntarily submit my will to His. What a faithful friend and personal trainer!